This 32-page survey result booklet offers an analysis and brief discussion of each question asked in the 2014 Annual Resident Survey. There is also a section devoted to the yearly comparison data gathered from the previously published resident surveys. The information gathered through this survey provides an understanding of the current trends residents are facing and their future plans. Although the resident population is a small percentage of practicing orthodontists, these doctors’ current decisions will ultimately affect the orthodontic industry and marketplace for the years to come. 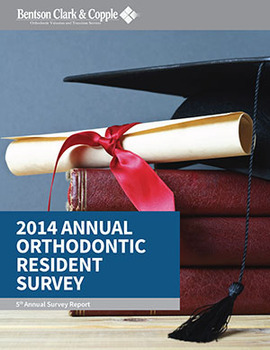 The 2014 Annual Resident Survey was completed by orthodontic residents from July 15, 2014 through September 15, 2014. The analysis is based on 418 valid survey responses that were distributed to the entire orthodontic resident population of 1,151 individuals in the United States, Canada, and Puerto Rico.